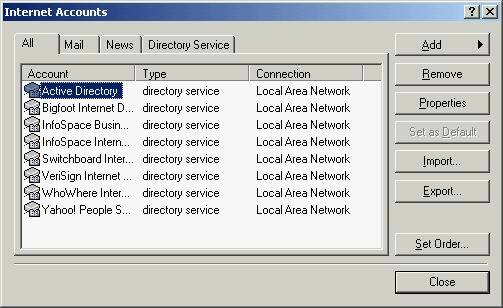 You will then see a screen that displays a number of different accounts that are provisioned by Microsoft by default. Select the Add option on the right hand side and then select the Mail.. option. You will then be presented with the following screen. 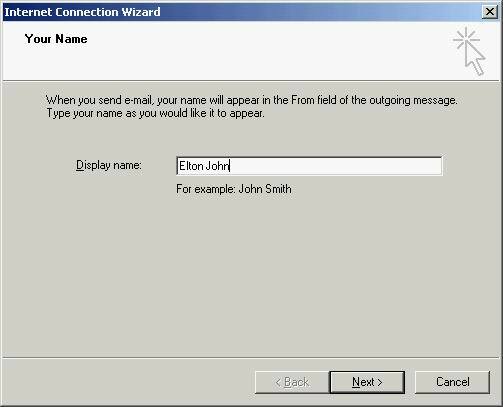 Enter your full name into the dialog box. This is the name other people will see when you email them. For example, Elton John. Click Next to continue. Now enter your email address into the dialog box. This is the username you selected at startup followed by the domain @beagle.com.au. For example, elton@beagle.com.au. Click Next to continue. 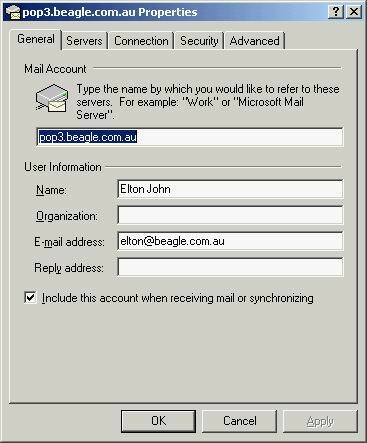 You then need to enter the Beagle mail server settings. 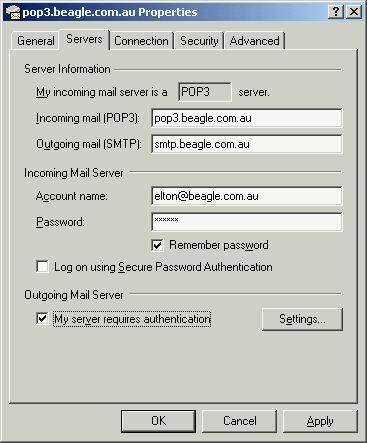 Leave the My incoming mail server is a setting as POP3 and enter the hostname pop3.beagle.com.au into the Incoming mail dialog and smtp.beagle.com.au into the outgoing mail dialog. Now enter your email address into the Account name dialog box. For example, elton@beagle.com.au. Then enter your password into the Password dialog. You may elect to click the Remember Password option if you do not wish to be prompted for your password each time you log on. 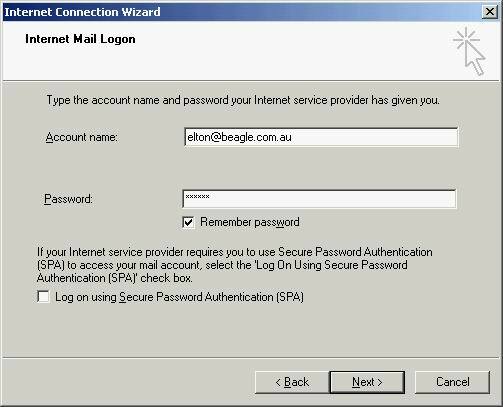 Ensure the Log on using Secure Password Authentication option is not selected and then click Next to continue. You will then be presented with a splash screen informing you that the setup process has finished. Click the Finish button to complete the configuration. 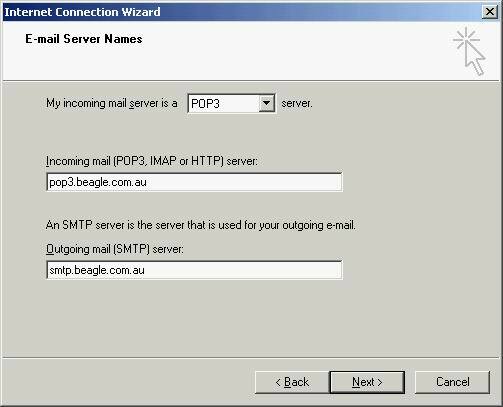 Further configuration of the Beagle Internet perferences is required so click on 'pop3.beagle.com.au' connection and select Properties from the right hand side. Click the Servers tab at the top of the dialog box. You will then be presented with the following screen. This is an important step - do not skip it. Select the My server requires authentication tick box at the bottom of the screen and then click Apply and then click OK.
Now click Close to close the Accounts dialog. Ensure that the Hang up after sending and receiving option is NOT ticked. 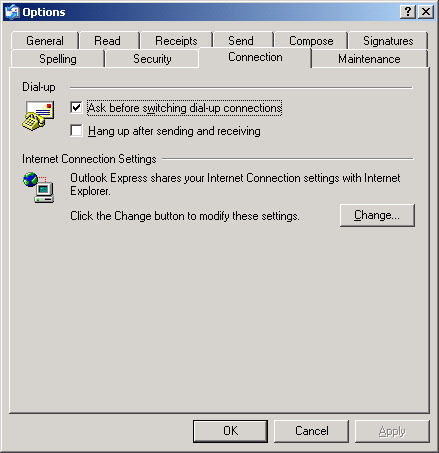 Then click OK.
You must now close and then re-start Outlook Express in order for the new settings to register. 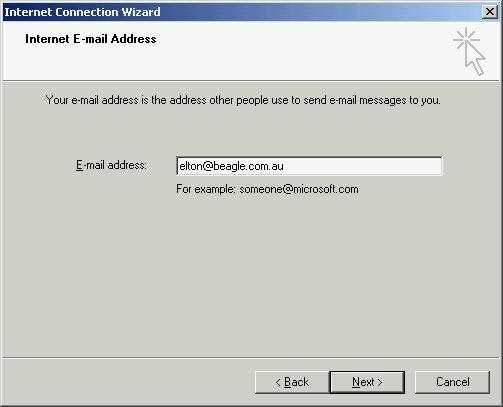 You are now ready to send and receive Email using Beagle Internet!